Shepherd’s Voice Radio and Television Inc.
Ben, old and poor, his wife Lucia, their granddaughter Narda and her brother Ding sit on the floor of their shack, having only a bowl of porridge for lunch. A hungry burly neighbor sees the porridge and breaks into the house in an attempt to steal the food. Ding promptly fishes out a white stone from his pocket and hands it to Narda. 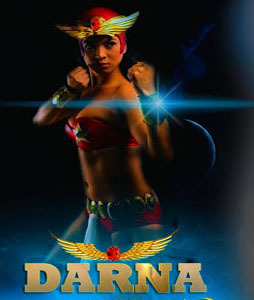 Magically, Narda turns into Darna, a mighty female warrior. She fights the burly neighbor. The neighbor fights back, kung fu style. But the guy is no match to Darna’s superpowers because she is really an extraterrestrial warrior who had died but who resurrects through Narda. So, the bad guy runs for his life. And Ben, Lucia, Narda, and Ding get to enjoy their bowl of porridge. That’s my version of a scene in the Mars Ravelo comics story about the super-heroine Darna played by Angel Locsin, during my not-so-distant younger days, in the high-rating GMA-7 television series titled, yes, Darna! If you are my age, you know that Angel Locsin— Angelica Locsin Colmenares in real life, born April 23, 1985— is a film actress who has an International Emmy Award nomination, plus a FAMAS and Film Academy of the Philippines trophies among the awards on her shelf. Angel is also a commercial model and film producer. After she finished her primary education at St. James College in Quezon City, and high school at the University of Sto. Tomas, she took up a short course at the Central Saint Martins College of Art and Design in London. So, now she is also a fashion designer. Not so known to many, Angel plays Darna in her real life, standing up for the abandoned, the weak, and the oppressed. Angel celebrates her birthday supporting women and children, organizing gift-giving parties for the less fortunate. She is Christian, but she traces her roots to a Muslim Royal Family on her mother’s side. Small wonder, she served refugees at the height of the Battle for Marawi last year. Last April, Angel celebrated her 33rd birthday in Anawim, our Home for Abandoned Elderly. 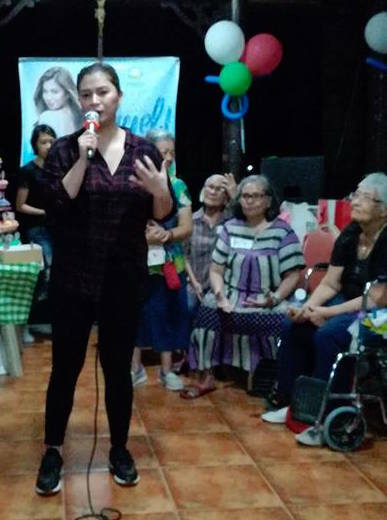 Along with members of her fans club named Angels, she brought party packs plus cakes to share with our lolos and lolas.packs plus cakes to share with our lolos and lolas. Happily, she greed the elderlies, hugging and kissing them. Actually, Angel was not feeling well on that day, she confessed to our lolos and lolas. “Pero pagdating ko dito lahat ng problema ko nawala nang nakita ko kayo. But my problems disappeared when I saw you all,” she said. “Ngayon lang nag-sink sa akin na happy pala talaga ang birthday ko. Only now that it did sink in that indeed, my birthday is happy,” she added. Angel thanked mga nanay at tatay, as she called our elderlies, our Anawim staff, and members of her fans club for making her happy on her birthday. “Pinasaya ninyo ako. Maraming salamat po,” she gushed. In heartfelt gratitude, Lola Viola (with microphone) prayed over the actress asking our good God to bless her with good health, happiness, and guidance in all that she does. social workers, caregivers, the rest of the staff and volunteers, not to mention our supporters and donors like you, our Kerygma Family. P.S. Wanna be a Darna to the partner beneficiaries of our Mercy Ministries? We are able to sustain our Mercy programs because of the generous support of our members worldwide. If you feel the Lord is calling you to support our mission by giving a monthly donation, please click here. For inquiries, please email us at support@kerygmafamily.com. SVRTV © 2017. All Rights Reserved.